The Lost World of Drfugawe | Seeking the meaning of life, one meal at a time! OK­, I’ve been putting this off long enough. My ride on the merry-go-round of blogging is coming to an end – I’ve felt it slowing down for some time now – and just like the kid on his favorite wooden horse, that sense has brought me mixed feelings. It’s been great fun – and really served me well in this phase of my life – certainly one needs an activity which will keep one’s mind at work. And if you’re going to look for something to meet that criterion, why not combine a few of your life joys – in my case, food and writing – it’s been wonderful. But that same sense also brings a real sadness – no one can just stop doing something they love and still escape a feeling of sadness – I think it’s one of the paradoxes of happiness; one never comes without the other. Yes, I’ve spent a lot of time thinking about this, and I’m comfortable with my decision. And I wanted to share that rationale with you – hey, we’ve got a mutual investment here – don’t we? Sure we do. And as I’ve said several times before in these pages, if I was ever to give this up, I’d at least leave a note explaining why – to me, that’s part of the deal. I’m not a ‘bucket list’ kind of guy – not that I’m against goal setting as a part of life – but to me, it’s a little sad to wait until the time when you know it’s coming to an end to do something you should have been doing all along – to me, the bucket list is a part of life, maybe with a different name. But then, anyone with a basic understanding of strategic planning would feel the same. Even so, the advent of my retirement brought with it an opportunity to do things that had here-to-fore not been possible – and yes, I made a mental list of those things I’d now be able to do. Is that a bucket list? OK – whatever. I also had hundreds of other things I intended to spend time at – lots of travel, for one, but we soon discovered that requires a lot more money than we had available. And then there was all that experimental horticulture stuff I wanted to do, a la Luther Burbank (one of my heroes), and I suppose there is some of that I do engage in – but the science often alludes me. And then there was the nature stuff – the trips to the woods to hike, and gather wild foods, or just to absorb the mystic – or to the beach to do the same. But those 5 and 10 mile hikes on wild woodland trails never did materialize. In fact, few of my assumptions about how I’d use my freed up retirement time actually panned out – it was the accidental and surprise activities that took up most of my time – and chief among those was blogging itself. I don’t remember including blogging in my initial activity plans, but I did want to do some writing – and I thought I’d like to get paid for doing that! Hey, why not. In my career work I was doing a lot of writing and I sure as hell was getting paid for that – so, why not? Over the past 4 years, I’ve averaged better than a blog post a week – I think that’s a pretty good rate – but it’s also one that exacts a price. Not that there isn’t a whole lot of satisfaction – yes, there is. There is something about the act of expressing oneself that is cathartic, resulting in feelings of great satisfaction, and even liberation. I think it’s a secondary human need, and perhaps shared universally by all – although perhaps not to the same driving emotional force for everyone – especially at those times when the downside begins to play out. I know I’m preaching to the choir here – every fellow blogger knows exactly what I’m saying – and I suspect that almost all readers of this post will also be bloggers themselves. Still, this is essentially the emotion that has been working at me for the better part of the last year, and I cannot let the opportunity pass without giving voice to it – and for just the reasons I have expressed above. There is a rule of life that came late to me – essentially, that the degree of satisfaction we receive from any endeavor is roughly equal to the amount of physical and emotional investment we are willing to put into it. Simple enough – and I’m sure most of us would readily agree. But I think this simple rule may be the essence of maturity – and no one ever said I matured early. And it doesn’t matter if we’re talking about one’s career, or that same person’s leisure time activities – the rule still applies. And it surely applies to blogging! As I look back on my early blogging days, I can see that I tripped over this rule time and time again. I overemphasized the joy of expressing myself and discounted my contingent responsibilities. Sooner or later, it dawns on you as a blogger that you owe something to your potential reader – even if you don’t have, or ever will have, any potential readers! Yeah, the early days of a blog are tough – you pour yourself into every post, and you have absolutely no idea if anyone is even seeing it. Yeah, WordPress is good at telling you how many ‘hits’ your post has had, but you still don’t know if those were intentional or just accidental drive-by’s and spammers. And then comes the day when you get your first comment (I mean of course, your first comment from a non-relation! ), and your education into what readers are looking for really begins. But even now, after almost 5 years of steady blogging, I’m sure my brand of food-blogging is only attractive to a very small, distinct audience of readers – and I think most of those ‘regulars’ keep reappearing in the Comments section because they’ve become friends – and this is one of the by-products of blogging that I didn’t consider when starting. But it is one of the elements of blogging that keep you going – it keeps you invested and rewarded too. And it is this ‘friendship’ part that gives me pause when I begin to consider giving up blogging – but then I realize that almost every one of my blogging ‘friends’ are themselves a blogger, and our contacts will stay alive through their own posts and comment discussions. So, what is it that I won’t miss about blogging? Not a hard question – more than anything, I won’t miss the photos. Have I ever told you how I hated having to take pics of the stuff in my posts? I really did. Not so much the bread posts – ’cause you can take a bread shot anytime, unless you too quickly eat it! But the shots of dinner always gave me trouble – what I discovered was that you could either get some good dinner shots, or you could enjoy a hot meal – not both! And those shots of dinner are easily the most difficult of all food photos to take – and some of my blogging friends were taking shots with cell phones that made my stuff look lame. I tried, but I just never caught on to the photo part of blogging. Have you noticed yet that there are no pics on this post? A new first for me – and a belated celebration of sorts – humor me. I won’t miss having to worry about not having an idea for the next post. Every blogger knows this is not because you don’t have a list of ready topics for your next post – we all have one. But food bloggers don’t do posts from lists, they do posts from inspiration – and once your inspiration wanes, you need to be looking for a new muse. I also won’t miss having to try to rescue a poorly written post – every writer knows the feeling – and it’s always the stuff which was so hard to get out the first time – and when it’s done, you let it sit for awhile, and then you read it again – and you know. It’s just not good writing. Can it be redone? Often, the only reason why we think it can is because it was so damn hard to get done the first time! If our writing head is on straight, we know the right thing to do is to simply toss it, and start all over again – or go do something else while we wait for the next influx of inspiration. Nope, I won’t be missing that. And for those many times when I couldn’t bring myself to listen to my own inner voice of common sense, and I put out a post that never should have been made public, please dear reader, forgive. There isn’t much more I can add – except to say a heartfelt Thank You to all my blogging friends who so faithfully tagged along week after week, and most importantly, engaged in a follow-along discussion – often when one was not even worthy. I look forward to keeping in touch via your own continuing efforts. Now, another one of my lists awaits the newly freed up time I am creating; my list of books I’ve not yet read – I used to have such a reading list, and I really enjoyed pecking away at it. But when blogging came along, I just didn’t have the time to invest in continuing my reading list. So, I’m eager to restart that effort. I guess you could say that’s my bucket list – or as close to one as I’m going to get. Now dear reader, stay well, try to live a simple life, and work hard at being happy. And thanks for being a part of my world. 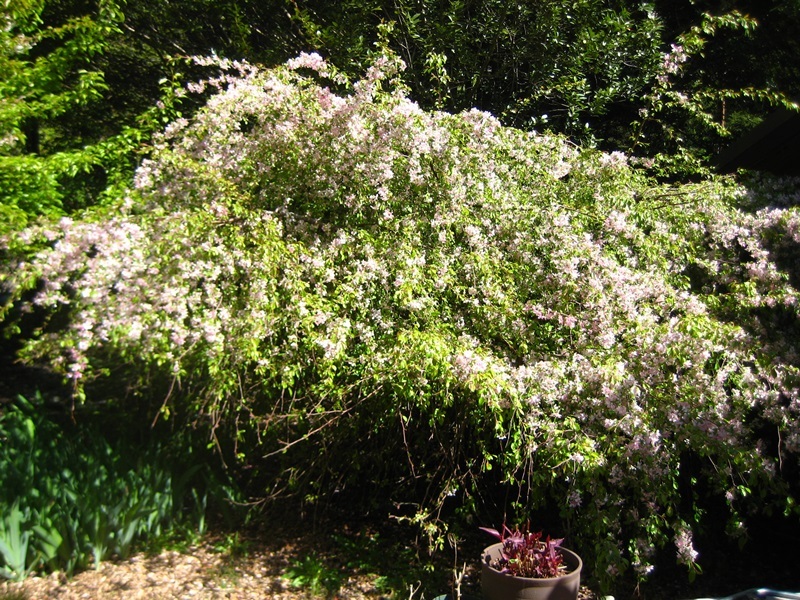 This has nothing to do with my post, but it’s Spring, and this is my Louisa Weeping Crabapple tree in full bloom – Gorgeous tree! I’m a slow learner. I realize now that my mother was well aware of this, and it must have been difficult for her, from a frustration end I mean. Were my education to begin today, I’d probably be labeled with one of the popular learning disabilities which seem to be so freely given out these days. At least, that’s the way I feel sometimes – and this is one of those times. Of course, it’s also quite possible that these new facts were once well known to me, and just fell down that empty well of forgetfulness in the middle of your -excuse me, my- brain. But that’s just another element of my aforementioned learning disability – whatever! But for all the many years I’ve been growing and enjoying things made with leeks, I’ve always cut off and thrown away the green parts. My cookbooks all seemed to be in agreement, they all said, ‘Use the white part only, discard the green end’. So that’s what I did. Not because I think cookbook authors are always right about everything – that’s not the way I think! But I’ve long thought that leek greens were tough and stringy – don’t know why, just did. Like I said, slow learner. And then I saw something on a website. Can’t remember where (sorry! 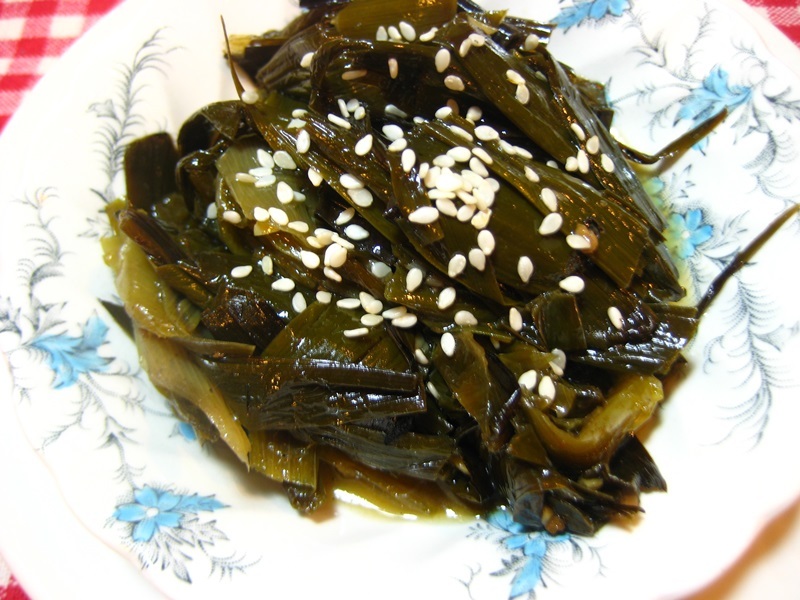 ), but they simply said that leek greens made a very nice side dish when braised – and although they may not be as tender as scallion greens, they can be braised to tenderness. So I stuck the idea into my head and made a note to try this next time I did a leek dish. And the more I thought about it, the more I realized that this new fact was just another piece in the puzzle that had been putting itself together for some time now – and that puzzle is not even new to this blog – this is not the first time I’ve done a post on how much perfectly good and edible garden produce we simply toss away instead of using for our own or others’ benefit – look here. (Apparently, I’m discovering that leeks make great stock, but not yet that they can be cooked up as greens!) And here I discover that Brussels Sprouts actually sprout twice – with equally delicious result. I think I learned this lesson well, for every spring now I watch all my winter garden greens, to catch them all at that precise moment when their tender seed heads are ready to pop open – that’s the perfect time to snip them off and quickly steam them for dinner. And I remember too that the puzzle is multifaceted, for each gardening year, I learn more about plants I thought were just weeds, but now know that many of those too deserve to be picked in their prime and eaten along with their more cultured kin. And somehow, we gardeners are of the opinion that if the seed we use didn’t come in commercial packets, it isn’t worth planting. I had one of ‘those moments’ recently while watching a documentary on the Middle Ages when they mentioned in passing that every house in the village had a garden, and that just beyond the garden was the area of edible weeds! Well, guess what? Many of the seeds in those commercial packets got their start in a Middle Ages’ weed patch. Like leeks. I’ll betcha. 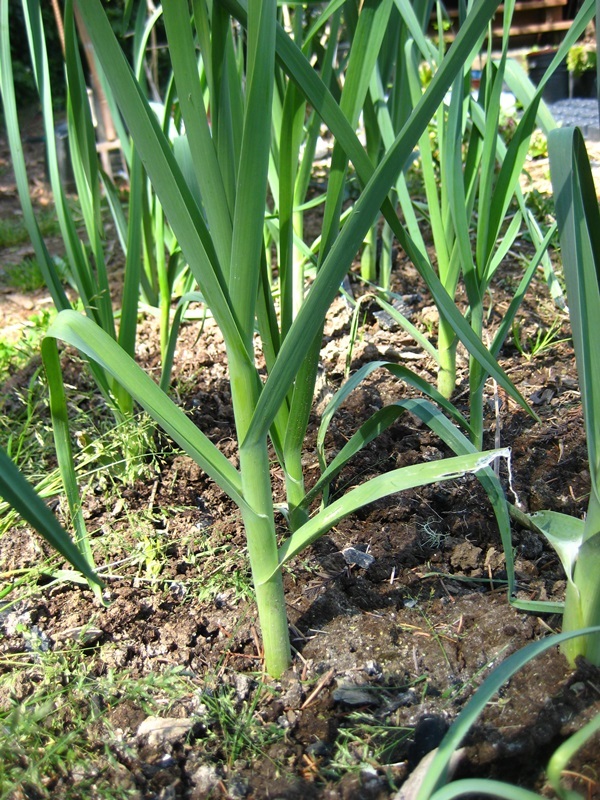 I grow leeks from seed which I start in my so-called greenhouse in Feb or March – then I transplant them into the garden in about June or July – there they sit right through the winter. I dig them any time they attained some size, but I have a slow garden (limited sun) and the leeks generally are still small come autumn – so I let them grow right through the winter, and the cold doesn’t seen to phase them – they may not grow much in winter, but they don’t lose any growth either – and come spring, they wake up and start getting downright chunky – mine don’t get huge, but they’re respectable size, sweet and delicious. What more can you ask from a leek? 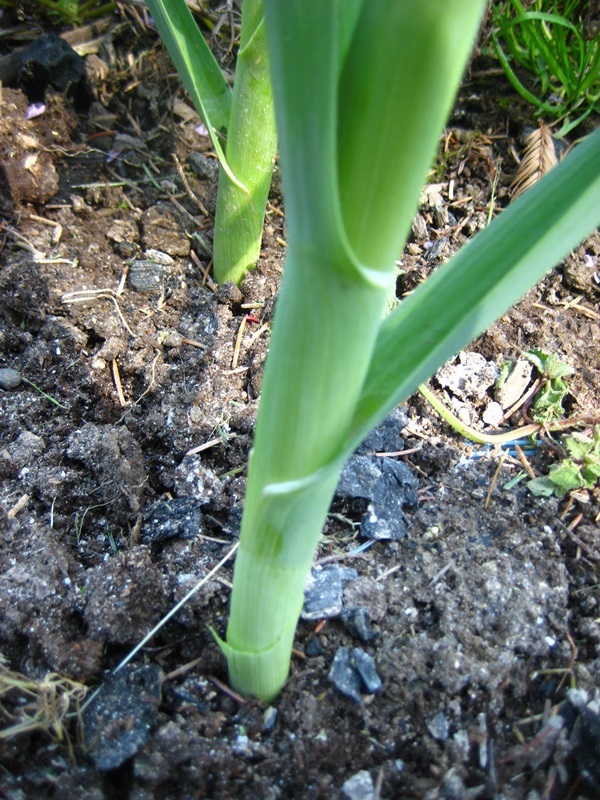 Wash the leek greens well and chop them in pieces about 2 or 3 inches long – now wash and drain them again (leeks are world famous dirt collectors, and unless you take pains to wash them, you should enjoy eating sand.). Chop the onion in a medium mince, and smash the garlic cloves and peel and mince them finely. Now heat that heavy pot, and when hot, add 2 or 3 Tbs of olive oil (or more to taste) and the washed greens – let them begin to get brown before stirring, but don’t let them burn – after a few minutes of stirring, add the onions and garlic and the chicken stock – stir all in well and bring to a boil – now lower the heat to keep a simmer going, cover the pot, and allow the greens to braise for about 10 minutes or more (depending on how old and mature your leeks are!) – if they are not tender when you taste them, give them more time. Keep an eye on the amount of liquid in the pot – if it gets dry, add some water, not more chicken stock to avoid getting it too salty. If you want to use the white parts too, just cut them into smaller pieces but don’t add them until after the greens have braised for 5 minutes or more – they are more tender and will cook more quickly. Serve as a side dish, sprinkled with sesame seeds – or mix with some bow tie pasta to serve with fish or roast meets for something special. Remember this next time you’re about to throw away that handful of leek greens. I’ve never done a post on salmon and I don’t know why – it’s something we make sure we never buy frozen (or previously frozen and thawed), and we avoid farm raised in lieu of better tasting wild fish. 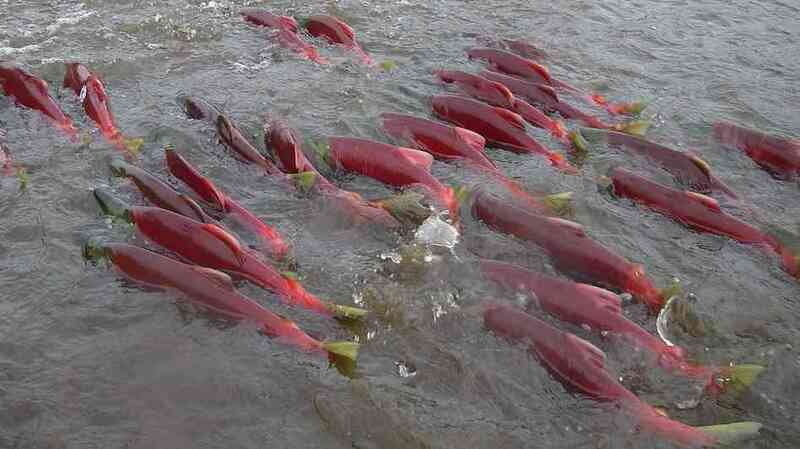 But although most of the world thinks Oregon is home to lots of salmon, I doubt we’re ever getting an Oregon caught salmon at the fish market – most of our wild salmon is coming from Alaska these days – and that’s wonderful stuff, so we don’t complain. There are many reasons our Oregon salmon is dwindling – the construction of hydroelectric dams on many of the rivers – destruction of habitat through forest clear-cutting and alternative uses of the land – the diversion of river water for agricultural purposes – and the impact of overfishing throughout the last century. 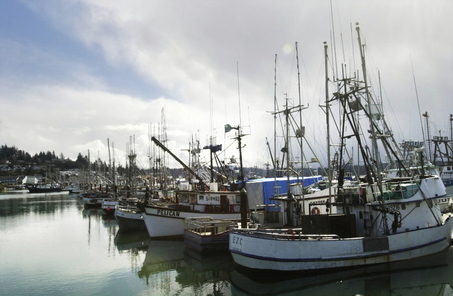 All of these and more have resulted in a once vibrant and active fleet of commercial salmon fishing boats in the Pacific Northwest (more than 4000 in 1980 landed more than 11 million pounds of salmon) shrinking significantly (less than 385 boats in 2011 landed less than 500,000 pounds). Although the recent catches noted above reflect mandatory restrictions and quotas, and the fishery is actually improving, it’s still surprising when we see ‘Oregon Wild Salmon‘ in our fish markets these days – and that’s sad. And most people would be surprised to learn that when they did buy a true Oregon Chinook salmon, there was only a small chance that it was a real wild salmon rather than a hatchery raised and released fish. Yup, an estimated 80% of all wild salmon caught today began their lives in a fish hatchery (the majority only after having the eggs removed from a natural wild mother salmon)! Equally amazing is the fact that only a little more than 1% of all those hatchery salmon actually survive their sea going experience to one day return to the river of their release – another sad fact. Yet legally, all hatchery raised and natural wild salmon can both be labeled as ‘wild caught’ – only differentiating them from farm raised (aka Atlantic) salmon. Is there some way you can tell if the wild caught salmon you just bought at the fish market was a natural born or hatchery fish? The answer is no, if you bought your fish as a fillet – but if you bought it as a whole fish, yes, there is a way. Every hatchery raised salmon has their ‘adipose’ fins (the small fin on the salmon’s back) removed prior to leaving the hatchery, and amazingly, every salmon commercially caught is checked and logged as to its adipose fin status. However, a fish seller is not mandated to make that known distinction to the buyer, and if you buy your fish the normal way -by the piece- you just won’t know. But you will know the salmon’s geographical origin of catch -that much the fish seller is mandated to tell you- and if that origin was Oregon, there’s only a 20% chance it’s a natural wild fish – and if it’s an Alaskan salmon, the percentage climbs to 50% (yes, Alaska too has salmon hatcheries). Does it really make a difference? To a purist, maybe – to me, no. I’m not going to worry over it. As long as we have something called wild caught salmon, I’ll buy it and be happy. I’d have to admit that one of my earliest images from the Oregon county was that from the writings of the pioneers arriving on The Oregon Trail, as they described seeing their first view of the fall salmon migrations up the rivers – they talked about huge fish, so thick in the rivers that one could walk across to the other side on their backs! Even though as a child I knew this was hyperbole, there was also a core expectation that there was at least some truth in these stories – and I had to have some of that same experience some day! And when that chance finally came to me, it was only after several years of trying -and some personal assistance- before I actually had my first sighting of a salmon jumping up a waterfall – and I have yet to see salmon so thick in the rivers that their backs were visible as they swam – but I live in hope. I have had what is probably a once in a lifetime salmon experience however – the area where I usually do my mushrooming is a section of the BLM forest called Cherry Creek – and that creek is so small that often at the end of the summer, it almost disappears. Yet, as testimony to the amazing innate drive and zeal of the salmon to return to the place of its birth, I was witness one autumn day to a huge salmon (perhaps 25 lbs – huge for the two foot wide, 6 inch deep stream in which it was attempting to swim) trying as best it could to make its way up a stream woefully unfit for such an effort by such a noble creature. It’s a vision that will go to my grave with me, and perhaps will fill the void in my brain of the vision of fish so thick that one could walk on their backs! As each fall season descends on us, I begin spending many days at the crabbing dock in Bandon – that particular dock also contains one of the few -and one of the nicest- public fish cleaning stations in our area. My crab catching efforts also coincide with salmon catching season, and it is not unusual to see a fisherman using this prime station to his just caught salmon. I’ve been lucky enough on several occasions to be leaving at the same time as a salmon was being cleaned and dressed – and on each of those occasions I’ve stopped to ask the cleaner what they intended to do with the salmon carcass, and my query has always been answered the same – if I wished to put the remainder of their beautiful fish to good use, they would be happy to oblige. And what does one do with a salmon carcass? Some absolutely delicious things, that’s what. 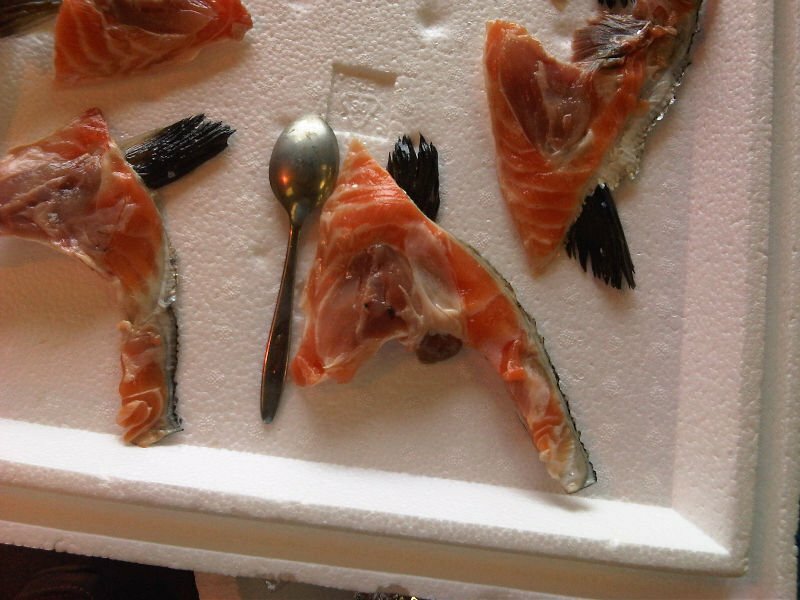 I consider it a crime that most of those freshly caught wild salmon ‘remainders’ are simply thrown away. These are premier fish, and you will never find any fresher! From that perspective alone, every morsel should be experienced. But there is more! I’ve yet to receive a fish from a cleaner that was ‘expertly’ filleted – I suspect most fishermen are just not that good at cleaning a fish well, and they leave far more fish on the bones than a professional would. But even a good fish filleter will still leave a carcass with plenty of usable meat – the head alone is a treasury of goodness. Preheat oven to 450°F. Coat a baking sheet with cooking spray (or see alternate method below). Heat 1 1/2 teaspoons butter in a large nonstick skillet over medium-high heat. Add onion and celery; cook, stirring, until softened, about 3 minutes. Stir in parsley/cilantro; and remove from the heat. 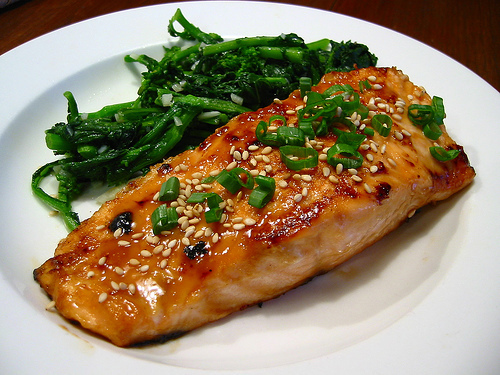 Place salmon in a medium bowl. Flake apart with a fork; remove any bones and skin. Add egg and mustard; mix well. Add the onion mixture, breadcrumbs and pepper; mix well. Shape the mixture into 8 patties, about 2 1/2 inches wide. Heat remaining 1 1/2 teaspoons butter in the pan over medium heat. Add 4 patties and cook until the undersides are golden, 2 to 3 minutes. Using a wide spatula, turn them over onto the prepared baking sheet. Repeat with the remaining patties. (If using precooked salmon, you may wish to simply continue the saute of the cakes in the skillet until nicely browned and thoroughly cooked through. 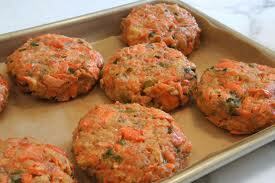 Bake the salmon cakes until golden on top and heated through, 15 to 20 minutes. 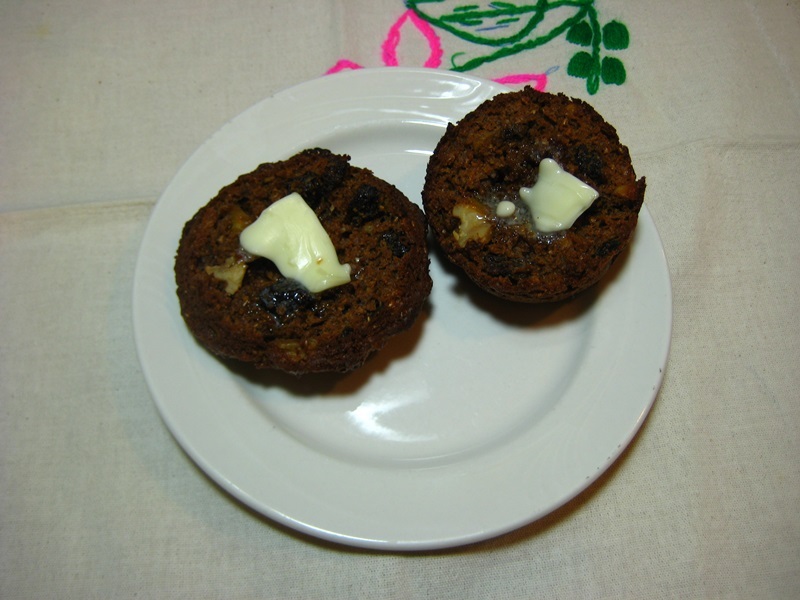 (Alternatively, you could continue to saute the cakes in butter over medium heat until nicely browned and crisp.) 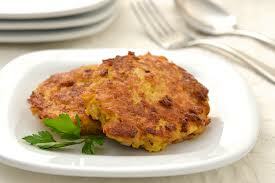 Serve salmon cakes with sauce of choice and lemon wedges. Prepare through Step 3. Cover and refrigerate for up to 8 hours. As I often do, I seem to have interrupted myself and strayed from my initial intention, which was to share with you our usual method of preparing a couple of beautiful slices off the filleted side of a salmon – let me remedy that now. Personally, I prefer a fillet over a cross-cut piece, only because I have become a lover of sauteed salmon skin, and a cross-cut does not allow that. For some reason, in my fish market, the tail section of the salmon sells for less than does the fillets from the midsection – but I see no actual difference, except that you are getting more of the delicious skin on the tail. Another reduced price part of the salmon I look for is the collar section – a salmon collar is located right behind the gills of the fish, and when the head is separated from the rest of the fish, there is still quite a bit of meat left on the head, and a good fish monger will cut the collar away from the rest of the head – and some lucky customer will get it. Why are the collars good? Because they contain more fat than do other parts of the fish, except for the belly, both of which are prized sushi ingredients. Sometimes you can buy the entire collar, skin and bone included – but my fish market only sells the big chunks of meat from the very top of the collar – on a big salmon, a chunk of the collar may weigh 4-6 ounces, just enough for a good serving! OK, here’s what we do almost exclusively to prepare our salmon – you can use this method with any of the cuts I’ve described above, but it is most effective with a skin on fillet cut from the midsection. We simply turn on the oven broiler to high, and heat an oven-safe skillet to as hot as it will get (smoking!). 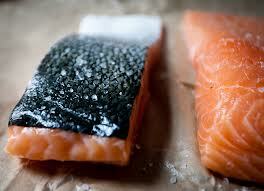 Once the pan is hot, sprinkle a little salt over the bottom and lay two salmon fillets, skin side down into the pan. Allow them to sear for a minute or two, depending on how you like your salmon done (we like it to be rare in the middle, so we may even shorten that time). While it’s searing, paint the surface of the fillets with Oyster Sauce liberally – once that’s done, and the salmon is seared, move the skillet into the highest rack your oven will allow (without the pan touching the broiler element) – don’t shut the oven door tightly, lest the broiler go off, prop it open with a metal spoon – allow the tops of the salmon to begin to brown some, but don’t leave them in the broiler for more than a few minutes – unless you want well done salmon (You don’t want well done salmon, do you?). Remove and serve. Do you think this may be just a little too simple? Well, if we listen to the best chefs, they all seem to say, ‘Get the best you can and cook it as simply as you can.’ Very true. Sometimes we add the juice of half a lime to the Oyster Sauce – and sometimes a tsp of sesame oil – frankly, any way we do it, it always seems equally delicious. So, just use your imagination and enjoy! I have a small stack of brand new cookbooks next to my corner in the living room (you know, big comfy chair, and all my ‘control’ devices close at hand). These were given to me at Christmas time by my L.A. daughter, who always seems to know what my interests of the moment are – I think Sandee leaks them! It’s probably time I began breaking into them to give me some new kitchen inspiration, and to feed my addiction for vicarious travel adventure. I’ve known for a long time that it’s far more fun to plan a travel adventure than it is to actually do it. And it’s a lot cheaper too. So most of my travel these days is the vicarious kind – and I really love a good food-travel book. And Melissa has included a beauty among the Christmas books she gave – ‘Burma, Rivers of Flavor’, by Naomi Druguid. And what makes it even more exciting is that none of us know much about Burma – do we! For years, it’s been almost like Burma didn’t exist any longer – that it just went away. And what makes that even more meaningful is that even when Burma was wide open and accessible, I doubt there was a city with more mystery and intrigue than Rangoon – even its name would send chills of excitement through you – at least me. Yeah, I know the names Burma and Rangoon have been officially changed, but I’m betting the rest of the world continues to use them for a long time. And I have never seen a Burmese restaurant anywhere, have you? So, the food of Burma is just as much a mystery as the country itself – it is with this level of excitement and anticipation that I bring you my discoveries. And the first will surprise you a bit, I’m sure – and require a little background. Burma is a land of heat – some things grow well, and some, not at all. Potatoes are one of those in-between kind of plants – they don’t take a lot of cold, but they don’t like a lot of heat either. In Burma, there is a short period of time each year of two months or so when potatoes will grow well, and then the rains come to put an end to them. 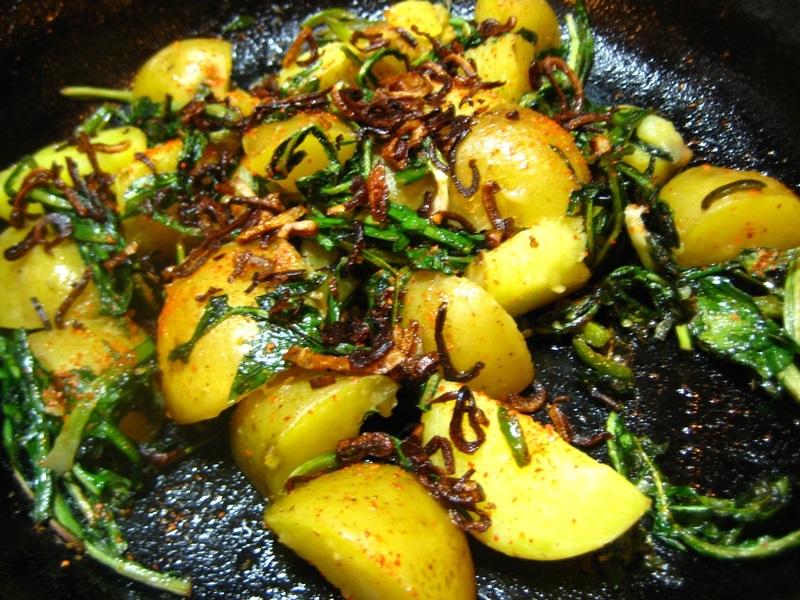 The Burmese enjoy their potatoes with a spicy edge, and a touch of bitterness too, which they traditionally get from hibiscus flowers – Druguid suggests a good alternative for those of us without access to exotic tropical flowers is a bitter green, like sorrel or even dandelion greens. Currently, in my part of the world, it is dandelion season. 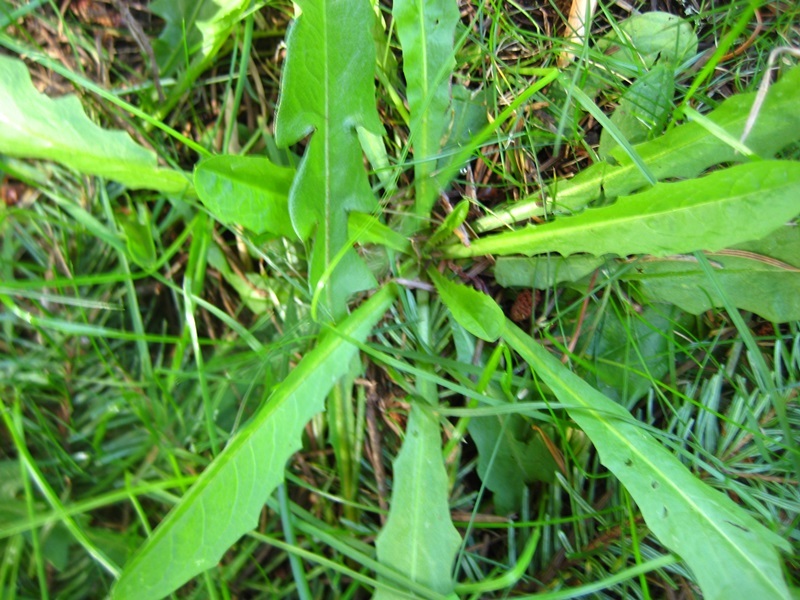 Some people hate dandelions – you can always tell who they are because their lawns are awash in dandelion flowers each April – those of us who would love to have a sea of dandelions in our lawn of course do not. Oh, I have plenty of non-grass kinds of things growing out there, but sadly, not a lot of dandelions. 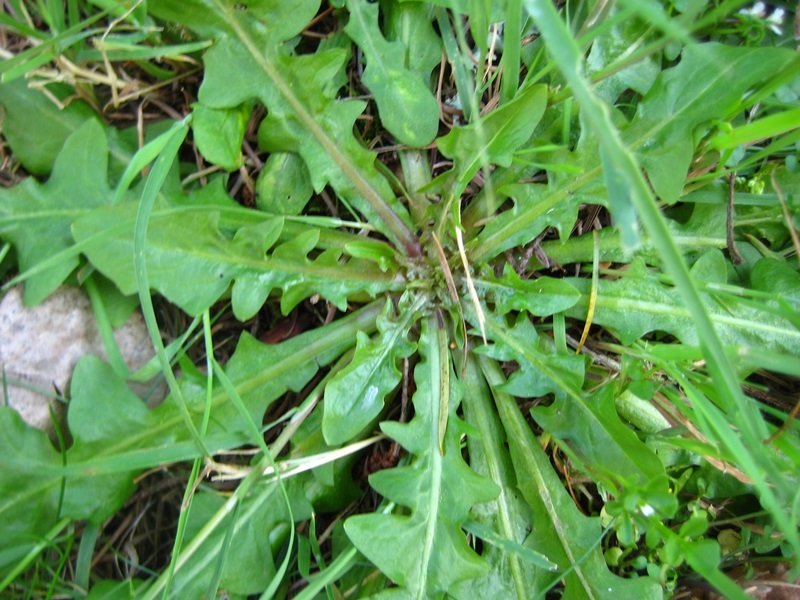 When I went looking for dandelions, I first had to spend a good deal of time researching just what a dandelion looked like, because unfortunately there are many look-alikes out there – fortunately, none are toxic, but then, few are as good tasting either. 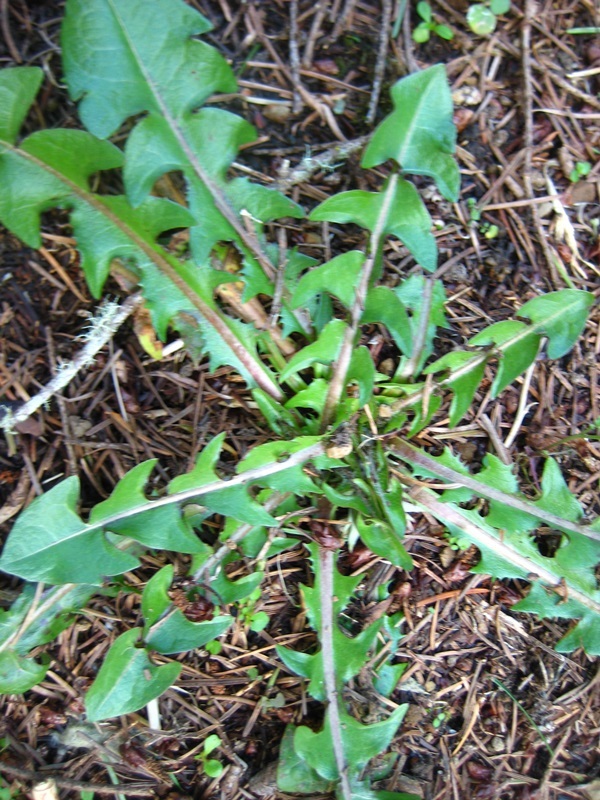 I’m betting that you think you know exactly what a dandelion looks like; and I’d bet you really don’t know! 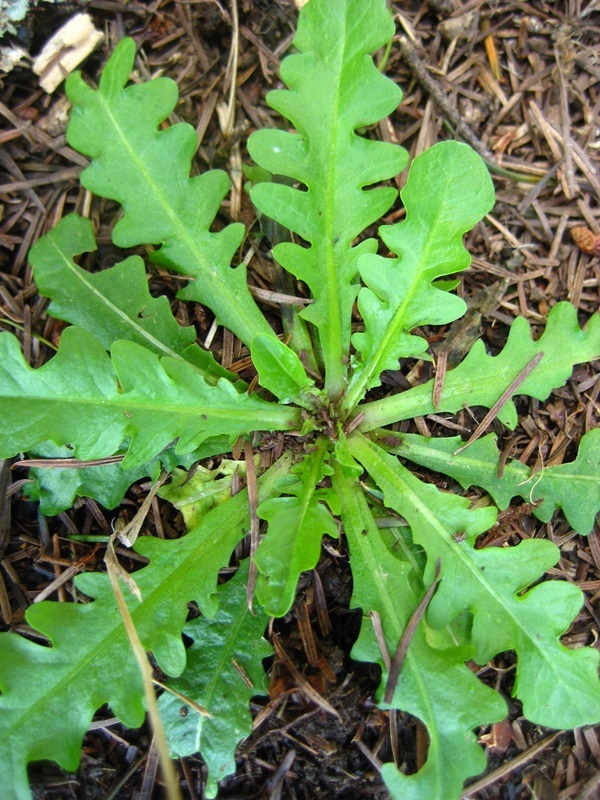 The identification problem arises from the fact that a dandelion grows from the top of taproot in a rosette form – in our minds, we associate this unique plant form with a dandelion, but actually there are maybe hundreds of other plants which grow the exact same way – and look very similar. 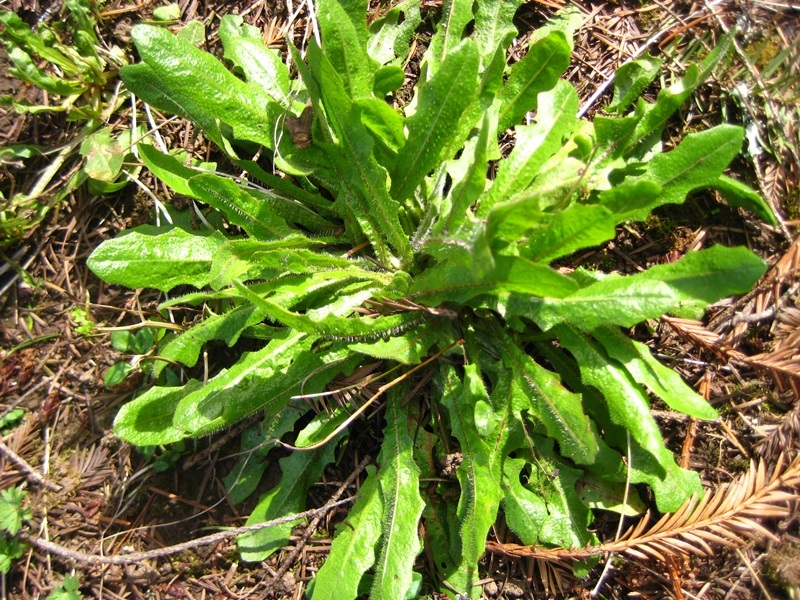 But there’s an easy way to ID a dandelion from all other look-alikes, because a dandelion sends out leaves with sharp points on them (from whence its French name has evolved – Lion’s Tooth), and the ends of those points always point back toward the ground, at least the bottom set of teeth do. No other of the look-alikes do this! So, now you know. 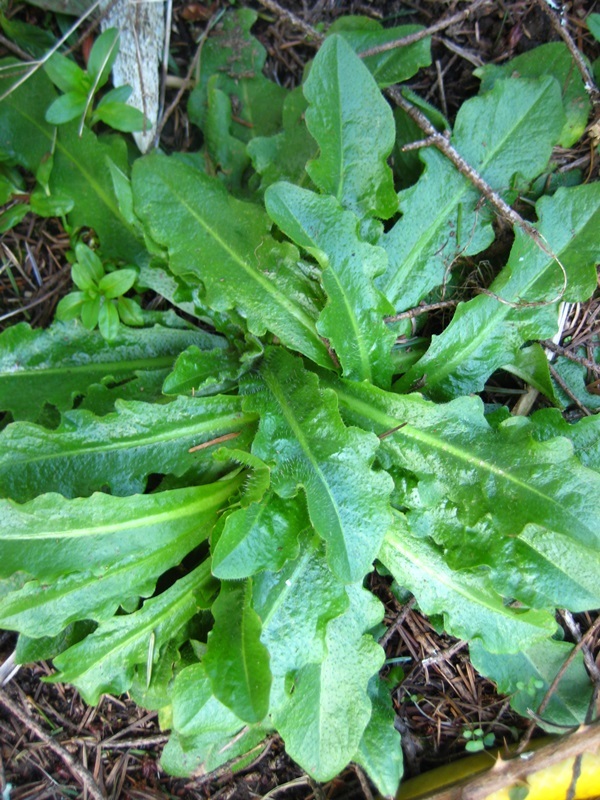 Let’s celebrate spring (at least in our part of the world) by making use of nature’s gifts – get out and pick some of those prime dandelion greens before they start flowering, for then their leaves turn even more bitter. But, and it’s a big BUT, that doesn’t mean they become inedible – those like me even enjoy the increased bitterness, especially if you are cooking them (as in this recipe) since the cooking tones down the bitterness. So here’s a Burmese, Naomi Druguid adaption of a springtime variation of a very basic side dish – and for many of you, a good introduction to a springtime veggie you should have been eating all along. Place the potatoes in a pan with just enough water to cover them. Bring to a boil, and lower the heat to medium low for a low boil. Continue until the potatoes are cooked through but still firm. Drain, place back in the pan – cover and set aside for 10 minutes. Heat the oil in a small skillet over medium-high heat. Add the minced peppers, and as soon as they begin to sizzle, add the chopped dandelion greens – stir as the greens wilt and everything gets mixed together – add the potatoes and mix all well while the potatoes get well heated – add salt to taste and remove to a serving bowl. Sprinkle some crisped shallots over all and serve. 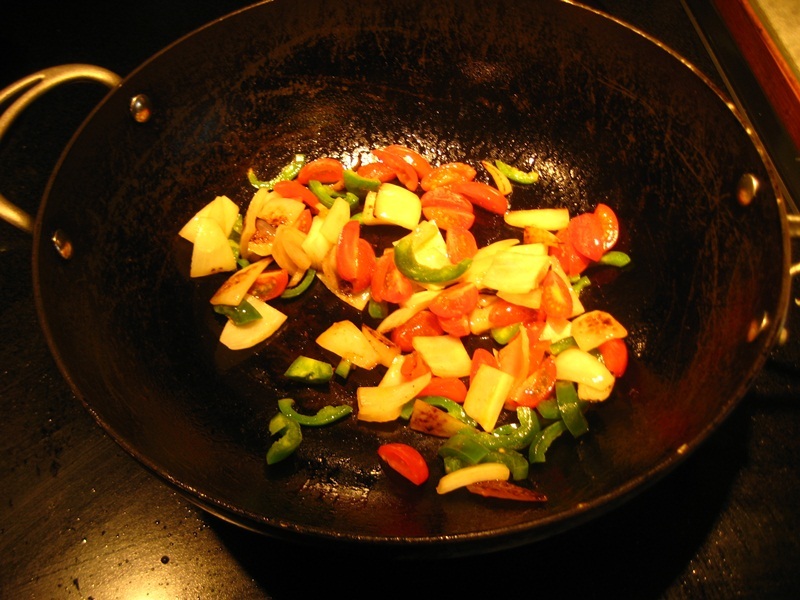 * All over Southeast Asia, the use of flavor infused oils is common – most often, they are very hot, with a chile base. But in this case, Druguid is suggesting one where the oil is infused with shallots – so not only do you get a more flavorful oil with which to cook, but a byproduct of crispy shallot – which can add another layer of flavor to this dish. In her book, Druguid provides a process for making a cup of shallot oil, and a corresponding large amount of crisped shallots – but for our purposes here, I’ll give you a trimmed down recipe for a smaller amount appropriate for this dish. Take 2 or 3 shallots and trim and skin them – cut down the middle and slice into thin slices, and place into a skillet in which you’ve heated ¼ cup of neutral oil (peanut or grape seed is good) over medium-high heat – stir – as soon as you see some of the shallot slices getting dark edges, lower the heat to medium, or lower – stir the shallots often while they are cooking – during their first 5 minutes of cooking, you want them to begin to take on a light golden color – continue occasional stirring, but do not raise the heat. Continue cooking another 2 or 3 minutes, as the shallots become more golden – be careful here, as they will quickly turn from golden to dark brown (burned!) if not watched. As soon as you sense them getting nicely brown, remove them from the heat. Strain the oil from the shallots, and place the shallots on paper toweling to dry and crisp for a few minutes. The oil is now ready to use – you should have just enough for this dish, and maybe more than enough crispy shallots too. I know what you’re thinking – and I agree – maybe this was not the best Burmese representative recipe in Druguid’s book, but I wanted to do the dandelion thing too – you know how we bloggers are – I promise I’ll go back and dig out a few more down the road. 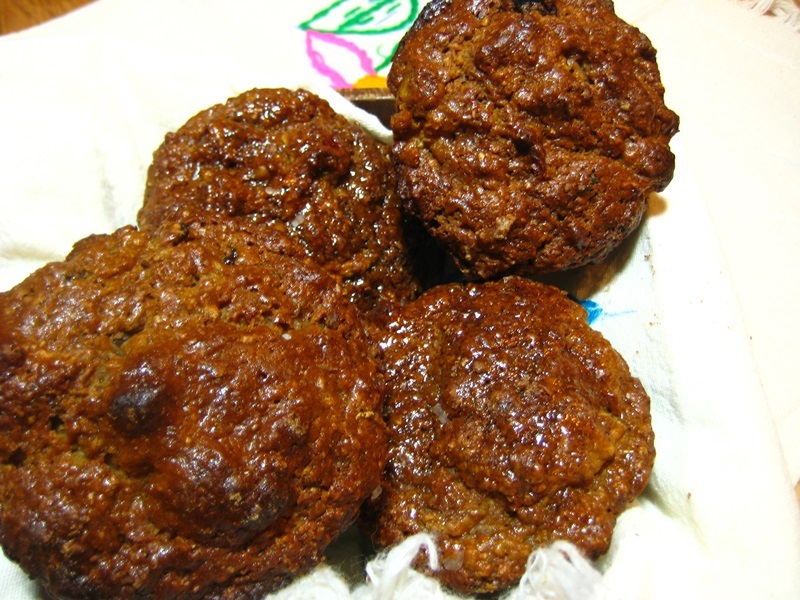 But it was a really good recipe for expanding our horizons a bit. 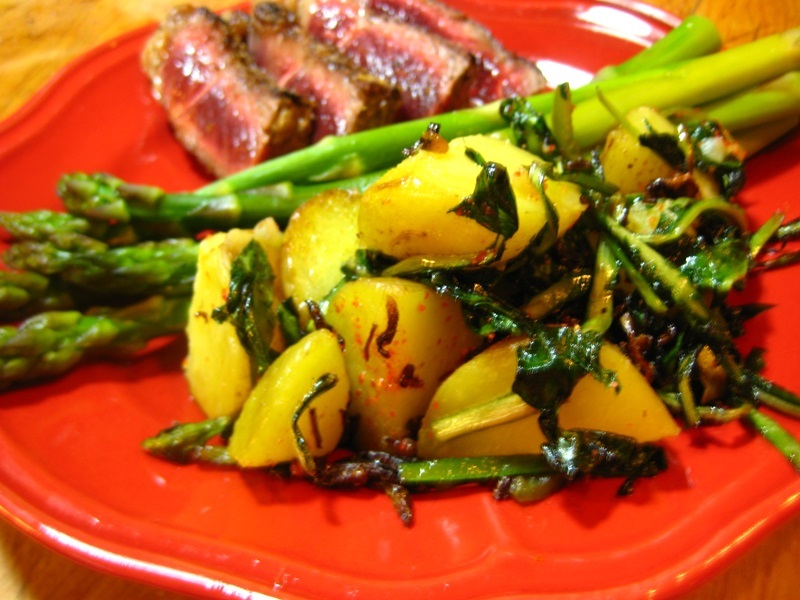 When was the last time you made a potato side dish that included bitter greens? If like me, maybe never – but it was simply delicious, and I’ll surely use it again. I hope you’ll give it a try, even if you adapt it a little – yeah, it’s OK.
Years ago, we moved to Oregon to rid our lives of the ‘traffic-jammedness’ of city life – anyone who has ever lived in an urban area knows the feeling – you reach a point where you just know you must escape or you risk losing part of your very being. And for someone from nomadic stock, as I was, it became essential. It was a wonderful move! But one of the things we miss about living in a city are all the live arts happenings – so this past year, Sandee and I decided we’d take ourselves more regularly into Eugene -the closest thing to a real city within 2 hours – and take advantage of their arts scene. 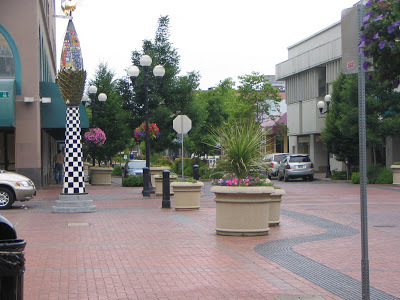 Now Eugene is not much of a city, size wise (little over 150,000 pop), but they do have a lively arts scene, much of which centers around the university (UofO). 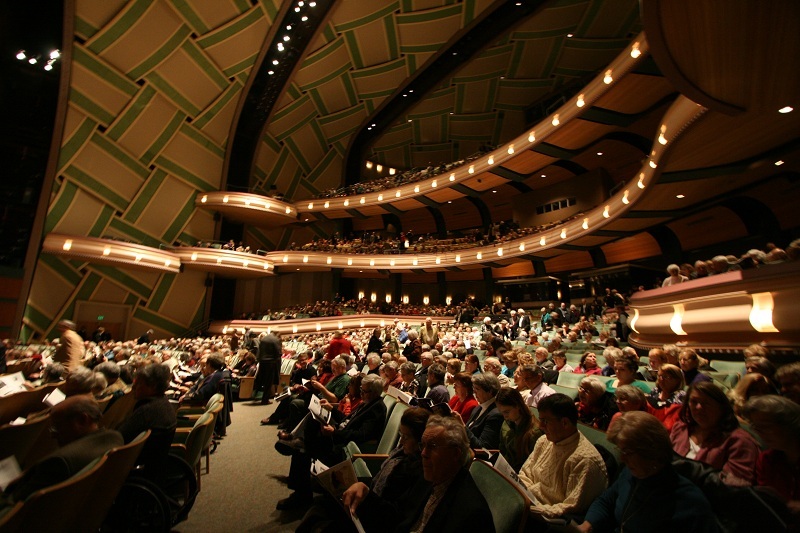 They also have The Hult Center for the Performing Arts, which surprisingly draws some top touring talent. I laugh when I hear Eugene folks complaining about the ‘traffic’ – trust me, Eugene has NO traffic problems. Parking problems are a different matter! I have a soft spot in my heart for city administrators and their problems – in a past life, I came very close to the subject of city management as for several years some of my college profs were city managers (one of my degrees is in Public Administration). Listening to their sad tales, and their oft repeated warnings never to consider a career in city management, I wisely avoided ever working for a bunch of elected politicians. But I also got a good sensitivity for how difficult it is for a local government to find the necessary funds to make things work properly – and parking fees often play a far more important role in the puzzle than the public ever realizes. Now, city managers are between a rock and a hard place on the subject of parking fees – after all, they can only consider them where there is something of interest for the general public – like downtown shopping, or a university campus with almost no campus parking availability. Do you suppose local downtown business owners like the idea of charging their customers parking fees? (how many shopping malls that you know of charge parking fees?) Do you suppose downtown business owners would consider running for city council so they might assist in making some of these parking fee decisions? See my point? As a patron of the Eugene arts scene during the past year, I’ve paid my share of parking fees – but I’ve also been sensitized to that rock and a hard place that the city manager must balance between, but I don’t think that means you just mindlessly pay without thinking – I’ve begun to learn how to play the system (I’m not a rich man) – and if you’ll allow me, I’d like to share a little of what I’ve been learning with you today. First, there are several rules which determine how well you’ll be able to avoid parking fees in Eugene – let’s look at those. Rule 1: Location, Location, Location- If you want to park a block off the UofO campus, you’ll pay $1.75 per hour – that adds up quickly. If you park in the convenient next door parking garage to The Hult for a performance, you’ll pay a $5 fee. If you decide to stay at the Hilton while in town, know that they now charge a hefty $15 a night for the pleasure. The closer you wish to be to your venue, the more you’ll pay for parking in their parking garage – nothing earth shattering about that fact – but how do you avoid it? Well you could move away from your venue a bit, until you find street parking without meters, but sometimes this option is not workable. In that case, see the next rule. Rule 2: Timing is Everything– In that fine balance the city manager must strive for, there are prime times and non-prime times. And of course, those prime times are precisely the times when parking fees are in force – all of this has been carefully planned to take full advantage – but there are some interesting exceptions too – you just have to know about them. Rule 3: The More You Know, the Less You Pay– Or, the more mistakes you make, the wiser you become. After a year of paying all those parking fees, I now know how -at least minimally- to avoid them. 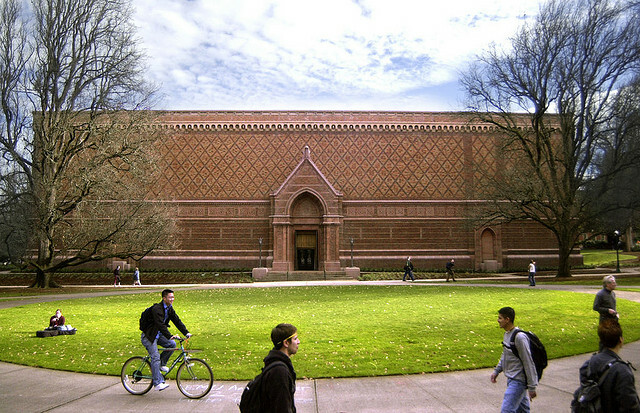 OK, let’s get to the meat – let’s say you want to visit the Jordan Schnitzer Art Museum, which is on the UofO campus – wonderful museum, but how is one to get to it? Even if you were willing to pay big bucks to park in a museum parking lot, there is no museum parking lot! The closest parking is just off campus on the street (at $1.75 an hour), and I don’t consider that a viable option. What to do? Best option is to move away from the campus itself -into the residential areas surrounding- and search out no-meter street parking. But you soon discover that such parking spots are relatively rare – they all seem to be used – and then there’s the long walk back to the museum – and for Sandee and her bad knees, that’s not even do-able. Answer? Timing. Weekend downtown parking is completely free – garages, street, and most interestingly, most of the conscription lots all around and on the UofO campus (one important caveat – read the meter or small sign at the head of each space – there are some spaces which never free up, while all others are up for grabs each weekend – and after 6pm each night too). There is a very large lot on the corner of Alder and 14th Streets which very conveniently makes the walk to the museum quite a short one – and I’ve yet to see it completely filled on the weekend. If you want to (or need to) get really close to the museum, simply drive into the campus on one of the limited access streets on the campus, and park in one of the lots usually reserved for university staff during the week – you’ll find most spots available (and strangely open!) on weekends and nights – I did not discover this fact on my own, but from a very friendly, and helpful, campus policeman. Most of the concerts at the on-campus Beall Hall occur at night, and it’s a little weird to discover that few of the many attendees apparently don’t know about the parking availability at the north end of Beall, choosing instead to park on the nearby streets and take the longer walk in. Careful though; some of those spots are the ‘At No Time’ variety – Read the signs carefully. How about a few other potential traps? 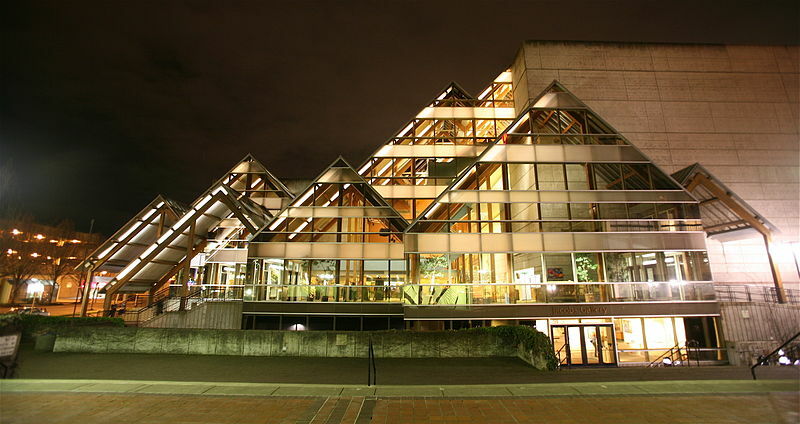 If you’re going to the Hult Center for a concert, know that although the parking garage next door to the Hult is city owned and operated (and that the city owned parking garages DO NOT charge after 6pm), there is usually a $5 parking fee during each Hult performance – but there’s a way to avoid it. If you drive into the garage after 6pm, but no later than 7pm, you will not be charged to park there. But the Hult doles out a bit of punishment for those who try this trick – the doors from the parking garage into the Hult Center itself will not open until 7pm sharp – forcing those who use this trick to either stand and wait at the door until 7pm, or they might simply walk around to the front door of the Hult for entrance prior to 7. Yeah, dumb. Don’t get me started on the Hult! 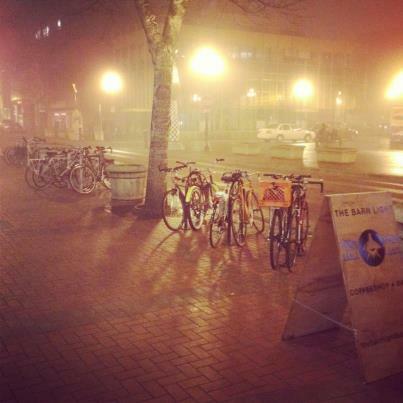 And here’s my last way to avoid downtown Eugene parking fees. 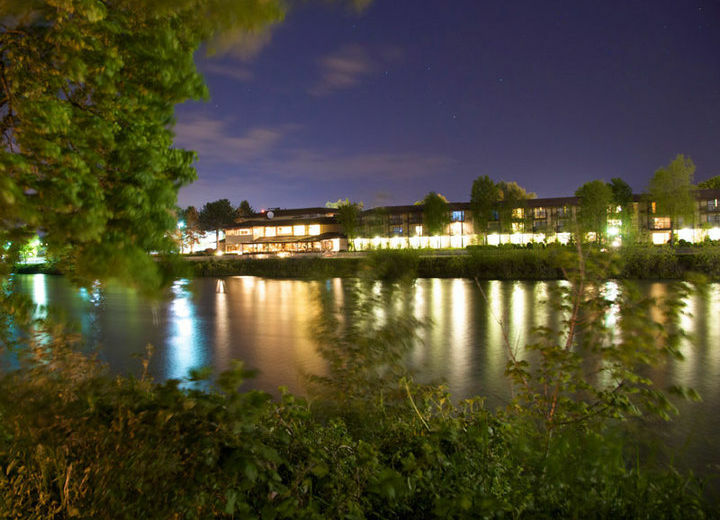 We have chosen to always do a one or two night stay when we come to Eugene for our adventures – and we often use Priceline to get our hotel rooms. I have the use of Priceline down to a science – here’s my not-so-secret formula for Eugene. I will only use Priceline’s ‘Name Your Own Price’ option for this, and I will only bid Priceline’s 3 star level – currently in Eugene there are only 2, 3 star hotels that choose to use Priceline’s Name Your Own Price, and they are both quite acceptable. 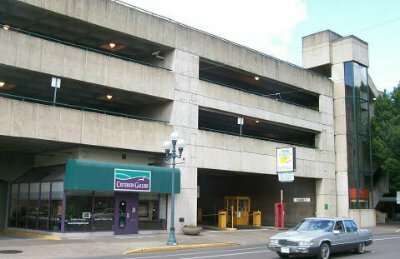 One (Valley River Inn) has no parking charge – the other (The Hilton) charges $15 a night for parking in its subterranean garage. So, you know going in that if your bid is successful, you’ll get either of these hotels. I won’t bid any lower Priceline bid star level simply because it’s then a crap-shoot – there are too many nasty motels that list on Priceline on the lower levels. And I won’t bid any higher than $45-$47 a night, and I often win at that level. The reason why I won’t bid any higher is that when you add Priceline’s cut (about $8, depending on your bid), you are getting very close to the cost of an acceptable 2 star motel, which is not much less comfortable than either of the 3 star choices. 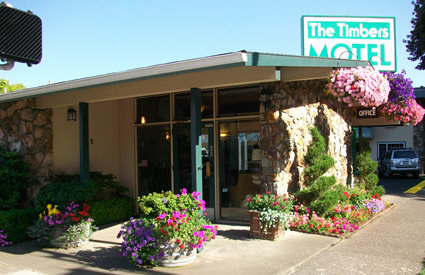 We like The Timbers Motel downtown, when we don’t get accepted for Priceline – a very nice motel, and very comfortable – usually available for about $60 a night – and free parking right in the heart of downtown. 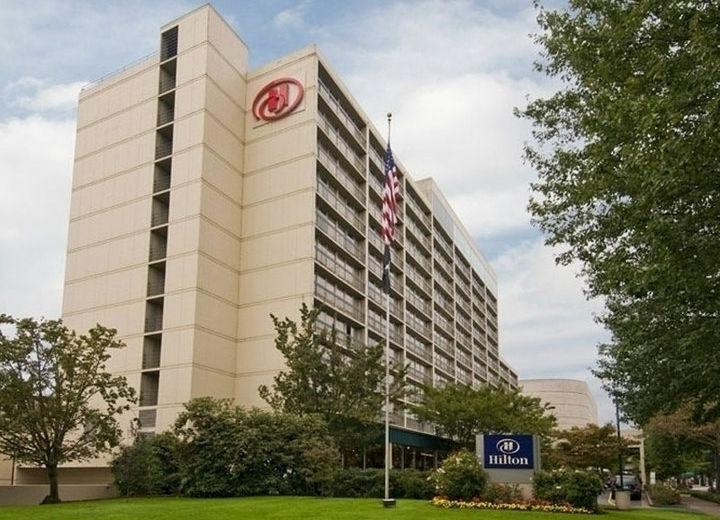 So, what do we do if we get a Priceline acceptance for the downtown Hilton? Well, we don’t accept their option of parking for $15 a night – we opt out and park next door at the city’s parking garage at no cost. And if it’s on the weekend, again, no cost all day – and if during the week, we can choose to exit the garage at 8am for the day, or just go ahead and pay the $6 full day rate – a lot better than $15 next door! Now, some may say, “What about security?” OK, here’s my answer – I had a most interesting conversation with a guy from the Eugene City Hall parking department regarding several questions I had – at first, I expected he’d be resistant to my suggested overnight parking in the city garage, but, No – in fact, he seemed sympathetic to my efforts to find an alternative to The Hilton’s parking charge – and in anticipation to my upcoming question about security, he even volunteered that each city garage had overnight security patrols. I doubt those ‘patrols’ are there to guard the few cars parking overnight, but hey, after paying The Hilton $15 for overnight parking, the first thing you read upon entering their garage is a huge sign that says The Hilton accepts no responsibility for any vandalism or theft from your car while parked there. All things considered, I’ll take the city garage, thank you. I hope this post provided some help for those who may be like us and need a little relief from what seems like a constantly increasing level of living’s daily cost. 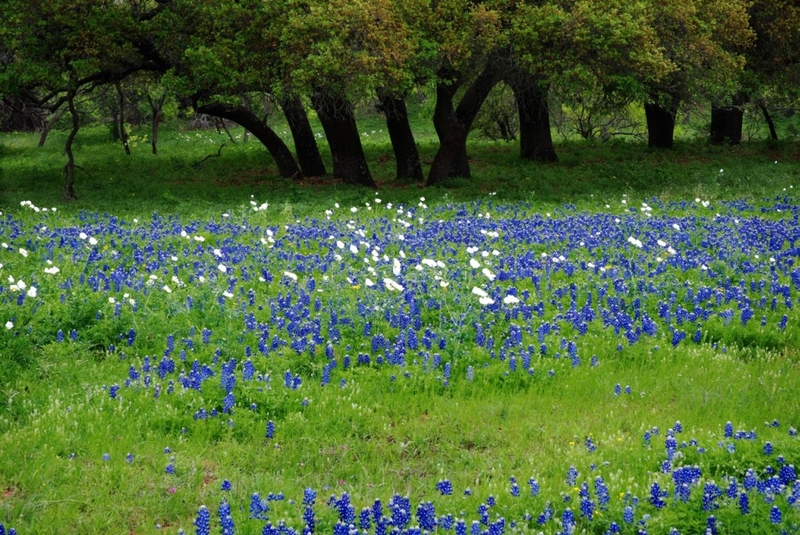 America’s Food Secrets – Even Hear of Migas? Recently, I found myself going through the Texas section of my old community fundraiser cookbooks for an idea for a new post in the ‘America’s Food Secrets’ series – it’s been awhile since I’ve done one, and I wanted it to be something good. 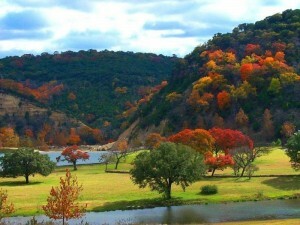 The reason why I was picking out Texas was that I’ve had some of the best meals I’ve ever had in Texas, and some of the worst as well! But, as they say, when it’s good, it’s very, very good. 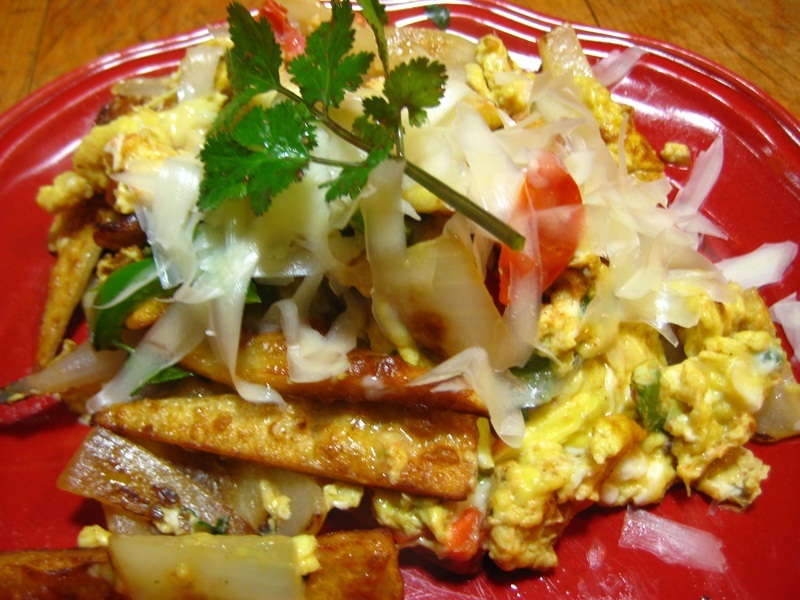 After a few hours of browsing, I’d scratched up some good old memories, but no winning idea yet – then I saw it – Migas! Migas is a very interesting word in the culinary world, and I’d bet that many of you have never heard of it. Originally it has roots in Spain, where it translates to ‘crumbs’, and historically referred to a dish that sheepherders would make from make from old, really stale bread, soaked overnight in water, and mixed the next day with olive oil and garlic and fried – it doesn’t sound really delicious, but then, I guess if you’re really hungry … So I bet you’re thinking, ‘Hey, is there a Mexican migas?’ Nice guess – yes there is. However, the Mexican migas is most often a garlic soup, which is even less like what Texans would call migas. So what exactly is the Tex-Mex migas? Well, let me answer that by telling you about the very first time I had it. I can remember being in San Antonio for a convention, and I was out at the crack of dawn for my usual tourist stroll – after an hour or so, I knew I had to have coffee, and I came on a busy restaurant, whose name of course I no longer remember. I went in. “What’s Migas?”, I asked the waitress. You may know that one of the rules for always eating well in a new restaurant is to ask the server, ‘What’s good today?’ If they answer, ‘Everything here is good’, you may want to just leave. Good restaurants instruct their servers on making a guest’s meal a meaningful experience – and recommending the best of the day is part of that – even if they don’t, a smart server knows a happy guest is a good tipper. And on this day, this rule was reinforced in my brain – ten minutes later I was presented with a big plate of wonderfulness that I knew was immediately going to the top of the list of my absolute favorite Mexican breakfasts. It was one of those meals that one remembers forever. It would be a fair question to ask, ‘Why should a dish that contains such common ingredients be suddenly special? '(and it was!) Well on first glance it may look like you simply throw some Doritos into a hot pan, slip in some scrambled eggs, and some salsa, and just before serving, toss in a little grated cheese – and you’re home. Nope! It may look like home, but it won’t taste like it. And when I show you the recipe I found, you’ll see why. My Migas recipe comes from a 1990 paperback titled, ‘Texas Country Reporter’, which may not technically be a ‘community fund raiser’ cookbook, but it was created by solicitation of recipes from Texas farm residents – and so it meets the spirit of our project intent. I’m going to immediately give you the recipe just as it appears in the cookbook, and let you see if you can determine why this particular dish may be more flavorful than all of its individual parts. ½ cup chopped chorizo – optional but very nice! Heat oil in a large frying pan to medium. Saute tortilla strips in batches (do not crowd pan) until crisp – remove to a paper towel to drain. Set aside. Remove remaining oil from pan and wipe. Add butter to pan and heat to med-low. Add chopped onions and saute while stirring until onions are just beginning to soften (you want a bit of crunch). Add beaten eggs, jalapenos, chopped tomatoes and cilantro. Stir all until well mixed and eggs are just starting to come together (this dish is much better if eggs are served soft – to achieve that, they must be only half done at this point). Remove from heat and add the sauteed tortilla strips, grated cheese, and chopped chorizo (if using). Stir one last time and serve with a bit more cilantro sprinkled over top. So, why would this dish be more than the sum of its parts? I think the answer lies in the freshness of this dish. This is one of those dishes that easily lends itself to short-cutting – packaged tortilla chips could be used – an already prepared salsa could be used too. Surely, these shortcuts are applied in many cases, and in many restaurants – but I would hope that it is the norm in Texas to prepare Migas as freshly as here stated, and as I was fortunate enough to get it on my first tasting. Having said that, I must admit to you that I have on many occasions taken the shortcut route with Migas, if for no other reason, to use up tortilla chips or old salsa – and I enjoyed those dishes. But, when making this for guests, I would always do it just like I’ve presented here – it’s just so much better. Of course, Migas is served with additional corn tortillas – this may at first seem to be a little redundant, but actually, the soft corn tortilla goes very well with the crunchy tortilla in Migas – and remember, there’s almost nothing that isn’t eaten stuffed inside a corn tortilla! It wouldn’t be gilding the lily either to put some chopped avocado and/or sour cream on top of your Migas. For those of you who enjoy Mexican food, you’ll need to add this one to your short list of dishes to watch for while you’re restaurant dining – and if you find it on the menu, don’t fail to ask how they prepare it – fresh is best – it’ll always be worth it.